On World Toilet Day, Unilever announced the launch of The Toilet Board Coalition. The aim of the new coalition is to tackle open defecation using market-driven solutions. The Toilet Board Coalition brings together some of the most forward-thinking organisations in the sanitation space: Firmenich, Kimberly-Clark, LIXIL Corporation and Unilever represent the business sector; Dr Val Curtis of the London School of Hygiene & Tropical Medicine and Barbara Evans of the University of Leeds bring academic rigour to the table; and a number of development sector and governmental bodies bring their one-of-a-kind resources and specialist knowledge: Agence Française De Développement; the Asian Development Bank; the UK’s Department for International Development; Stone Family Foundation; WaterAid; Water and Sanitation for the Urban Poor (WSUP); Water Supply & Sanitation Collaborative Council (WSSCC); the World Bank’s Water and Sanitation Programme; the World Toilet Organization; Water and Sanitation for Africa; and UNICEF. On World Toilet Day, IRC presents its ideas how to ‘systemically change sanitation in cities’. A new working paper marks one of the first steps in finding answers on how to reform a sanitation sector, which is failing a large part of the urban population. 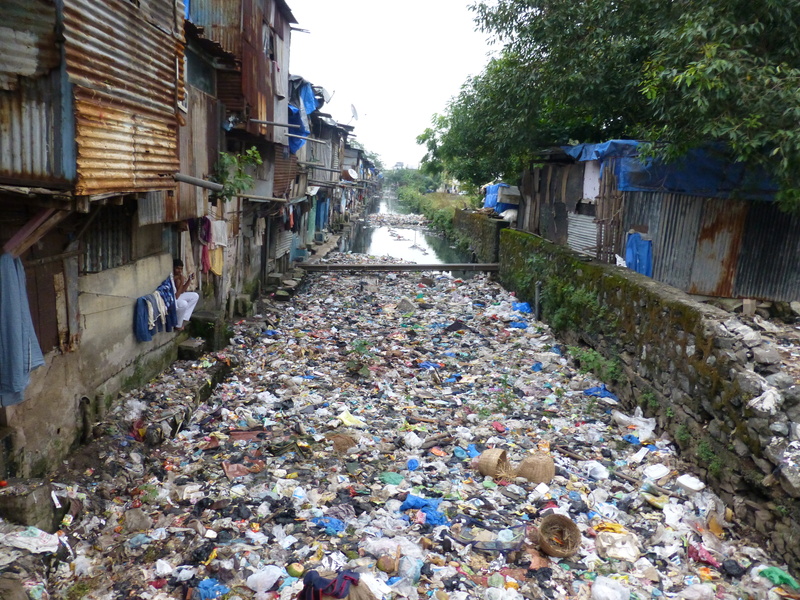 Convergence of human and solid waste in a stormwater drain in Mumbai, India (Photo by Giacomo Galli/ IRC). On World Toilet Day, IRC presents its ideas how to tackle sanitation in cities. A new working paper “Towards Systemic Change in Urban Sanitation“, marks one of the first steps in finding answers on how to reform a sanitation sector, which is failing a large part of the urban population. The problems in urban sanitation range from lack of facilities to lack of public funding and messy politics in urban governance.The root causes are systemic and technology alone is not the solution. Sida and WaterAid are organising a seminar on 19 November 2014, World Toilet Day, in Stockholm, Sweden. The Inspirational Morning Seminar on The Relevance of Sanitation and Hygiene in Addressing Children’s and Women’s Health & Rights will be held at Sida’s headquarters from 08.30-12.00. The seminar aims to raise awareness about the taboos and difficulties surrounding sanitation specifically as it relates to health and for example girls’ and women’s menstrual hygiene management (MHM). The seminar moderators are Ana Gren and Johan Sundberg. Robert Chambers – WASH, Women and Children: from blind spots to core concerns? The seminar will close with a discussion followed by a joint pledge to “Break the silence, Be proud – Don’t be shy, Tell your friends”. Register before 14 November on the Sida web site. At the first official UN celebration of World Toilet Day on 19 November 2013, a “mobile” toilet takes over the seat of Yemen at the UN headquarters in New York. Listen to the podcast of the UN Seminar and panel discussion entitled “Sanitation for All” here. A sculpture representing the World Toilet Day logo has been unveiled on Singapore’s Marina Barrage. Commissioned by the World Toilet Organization, the sculpture’s title “Evolution of Man: Poo Pee Happy” represents the evolution from cave man to civilised man, who enjoys clean sanitation. The World Toilet Organization organised the unveiling ceremony together with PUB, Singapore’s water agency, and the Ministry of Environment and Water Resources (MEWR). World Toilet Day is the brainchild of “Mr Toilet” Jack Sim, co-founder of the World Toilet Organization. Celebrated each year since 2001 on 19 November, the day has now been officially recognised by the United Nations. An interview with Jack Sim in the wake of World Toilet day was broadcast on Channel News Asia.